In this oral history interview, Stanley Jones (R’83) sat down with Ayele d’Almeida (’20) and Jacob Roberson (’19) on June 20, 2018, in Boatwright Memorial Library. Over the course of the one hour and forty minute interview, Jones discussed the community building he participated in on campus with Black students and staff, some of the “firsts” he encountered at the University of Richmond, the struggles of being taken seriously as a Black student athlete on campus, the formation of the first Black fraternity on campus (Phi Beta Sigma), his time in the ROTC program, and how the lessons learned at the University of Richmond mapped onto his time in the United States Army and as a counselor in public schools. Stan Jones is a native of Hampton, Virginia. He attended public schools in Hampton, Virginia and graduated from Hampton High School in 1979. Stan graduated from the University of Richmond and received his BA degree in Communications and Rhetoric in 1983. After graduating from the University of Richmond, Stan served in the United States Army as an Ordnance Officer. After leaving the military in 1992, Mr. Jones began his Education Career as an Intervention Specialist at A. G. Hudtloff in Lakewood, Washington. In 1995, Stan completed his Masters of Education degree in Guidance and Counseling at City University of Seattle, Washington. In 1996, he became a School Counselor at Clover Park High School in Lakewood, Washington. In August of 1999, Mr. Jones returned to the State of Virginia and became a School Counselor at Gar-Field High School in Woodbridge, Virginia. In February of 2000, Mr. Jones became the Director of School Counseling at Forest Park High School where he established the School Counseling Program. Mr. Jones developed a comprehensive School Counseling program by incorporating all aspects of Student Development to include, academic and career counseling programs. In July of 2003, Mr. Jones became the Director of School Counseling at Brentsville District High School in Nokesville, Virginia. In May of 2007, Mr. Jones completed his Masters of Education degree in Educational Leadership at George Mason University in Fairfax, Virginia. In July of 2006, Mr. Jones became an Assistant Principal at Brentsville District High School in Nokesville, Virginia. In August of 2009, Mr. Jones became an Assistant Principal at Freedom High School in Woodbridge, Virginia. In June of 2011, Mr. Jones served as the High School Summer School Principal of the Prince William Summer School program at Forest Park High School. 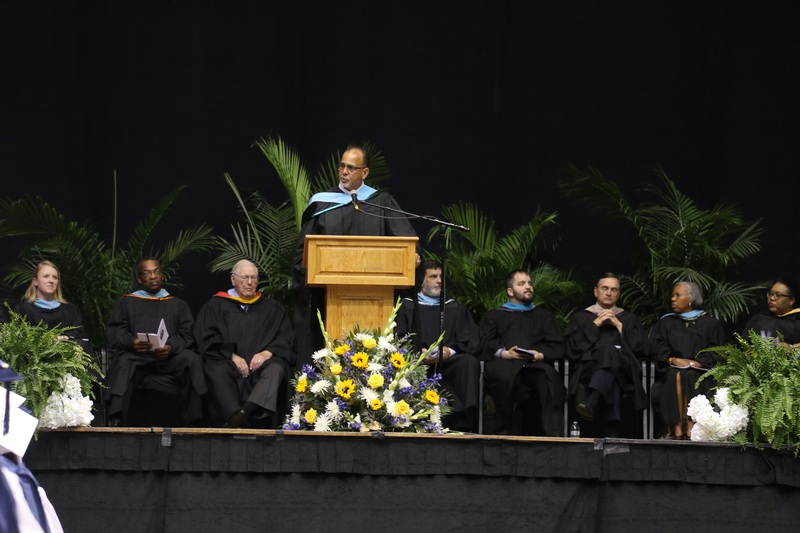 In 2012, Mr. Jones served as the Director of School Counseling at C. D. Hylton High School, and, in 2014, became an Assistant Principal at C. D. Hylton High School. He currently supervises the Social Studies, Air Force Junior ROTC, and Mathematics departments. Stan is married to LaRita Ross Jones, they have two lovely daughters, Alanah Yvonne a graduate of James Madison University in Harrisonburg, Virginia, who lives in Los Angles, California and Aliviah Loren, a 3rd year student at Virginia Commonwealth University in Richmond, Virginia. Mr. Jones currently resides in Stafford, Virginia. This oral history is available for academic purposes--including but not limited to research by students, faculty, and staff--by permission from the interviewee (Stan Jones). The interviewee maintains the copyright, and must be contacted via the Race & Racism Project (urraceproject@gmail.com) for permissions for use outside of academic purposes. “Oral History with Stan Jones (R'83),” Race & Racism at the University of Richmond, accessed April 18, 2019, http://memory.richmond.edu/items/show/2904.